EMU growth finalizes on a weak note with quarterly growth up at a 1.6% annual rate and year-on-year growth up by 2.5%. That 2.5% mark is still good enough to rank year-on-year EMU growth in the top 18% of all growth rates posted since 1997. The table fills out results for all of the original EMU members that have reported GDP at this time plus a few more such as Denmark, the U.K. and the U.S. The first thing that jumps out of this table is that year-over-year GDP slows in Q1 everywhere in Europe. Only Denmark posts a year-on-year decline. Spain and Portugal show three slowdown quarters in a row. The U.K. has five slowdown quarters in a row. In contrast, the U.S. has seven speed-up quarters in a row for year-on-year growth. In terms of relativity, European growth is only moderate. However, there is enough consistent growth that the ranking for the EMU as a whole is much stronger than for members in isolation. EMU growth ranks in its 82.6 percentile. In contrast, German growth ranks in its 66th percentile, France in its 69th percentile, and Italy in its 69th percentile. Belgium and Finland have rankings that are only slightly above the 50 percentile mark which designates the median gain for each country. Spain is below its median and Denmark is extremely weak with growth in the bottom ten percentile over this period. The U.K. has bottom 15th percentile growth while the U.S. has an 83rd percentile standing. Its 2.9% growth rate has about the same relative strength as the EMU’s 2.5% gain. The bottom line for Europe is that all reporters in this table show growth that is at or better than their respective median paces since 1997 except for Denmark, Spain and the U.K. There is enough consistency to European growth that even this moderate growth rate boosts the EMU to an 82nd percentile standing for its 2.5% rate of growth. If GDP represents the way things ‘are’ the ZEW indicators show that peoples’ assessment of the current situation is much stronger than what the standing of GDP growth merits. Assessments are in or round up to their 90th percentile except for the U.K. at its 50th percentile and Italy at its 82nd percentile. Still, both of those rankings are much stronger than the respective rank of GDP in the U.K. and in Italy. 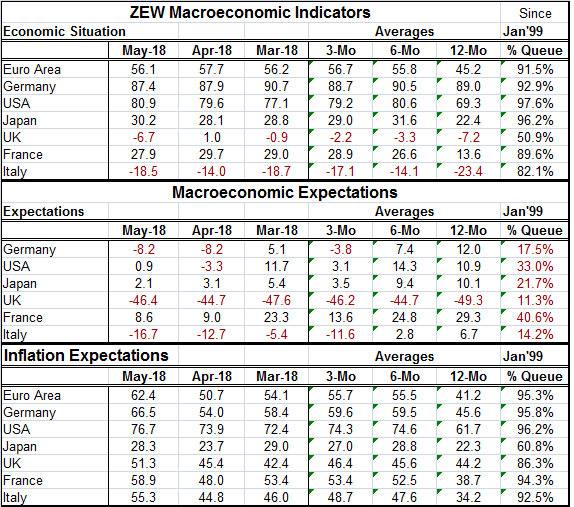 Interestingly, while we are looking for key central banks to start or to continue raising interest rates and generally to engage in less accommodative policies, the expectations for macroeconomic conditions are weak with most assessments having standings in their bottom 25 percentile. France is an exception with a 40th percentile standing; so is the U.S. with a 33rd percentile standing. But all of these are expectations with standings below the 50th percentile which marks the median for each country. Part of this is the widespread belief that inflation will be rising. However, there is no indication here of the magnitude of the increase expected in this survey. But inflation expectations are strong with a 90th percentile standing in the EMU, Germany, the U.S., France, and Italy. Japan at a 60th percentile standing and the U.K. with an 86th percentile standing are the exceptions. On balance, there is at least a hint of dissonance between what policymakers seem to be planning and the future that the ZEW experts see. While the assessment for short-term rates has the U.S. at a 92nd percentile standing, for the EMU the standing is at just the 61st percentile, a modest margin above its median. Expectations in the U.K. are at their 87th percentile which is odd given its inflation outlook but then again not so odd given that the Bank of England already is hiking rates while the European Central Bank is not.